We select our Women's Six Nations 'Team of the Tournament" and numerous other awards. There is no question here about who this goes to this time around. Bern is so young that it is feasible we will still be talking about her in an England shirt in 10-15 years and her move from the backrow now seems inspired. A properly atheletic ball-playing prop, she caused havoc in the loose this year, and though her set piece work is still something of a work in progress, that will only get better and better. A terrific prospect for the world game. In a tournament which showcased lots of new talent, Breach stood out for her high quality finishing and ridiculous nose for the try line. If she gets the ball in space, she scores, and though there are plenty of areas for her to continue to improve on, she is another of the young faces who will be around for years to come. This had been set up as the clash of the tournament with France coming into the match even as slight favourites following their excellent Autumn win over New Zealand. But alas, France's poor away form plus England's excellence conspired to make this game something of a formality with England cantering to a hugely impressive win and even in round 2, make it clear the title was theirs to lose. The Italians have been excellent this year, from the battling draw with Wales to the high quality attacking game they deployed against teams like France and Ireland. Much of this has been attributed to their experienced and very popular coach, and with a small group of players to draw from in Italy, di Giandomenico's skills in bringing a team from the bottom of the table to second must be applauded. The glue of the Italian team, Rigoni often pops up running exactly the line that Italy need, kicking exactly the ball that needs to be kicked and making the most effective defensive decision at just the right time. She is a leader in this Italian team but also a pleasure to watch. The France prop was a bedrock of strength in the games where the French pack dominated and although their influence waned as the tournament went on, she has been an outstanding source of strength. Other props of note were Leah Lyons before injury and Caryl Thomas who was excellent. Though honourable mentions here go to Carys Phillips and Lana Skeldon, Thomas was brilliant for France, grabbing hatricks, driving the French maul forward at a rate of knots at time, and proving a pillar of consistency throughout. At just 21 it is frightening to consider how good she will become. Setlted down from early scrummaging issues to add to her all round open play excellence, she really has been a force of nature and a unanimous choice surely from anyone who watched her as the Player of the Tournament. Amy Evans had a fine season for Wales too. Surely a long term option for England as captain one day, Scott was excellent at the heart of the England pack and has quietly become one of their most effective performers. A leader all around the park she makes the pack ahead of team-mates including Cath O'Donnell and Poppy Cleall who were of course all considered alongside Audrey Furlani who was strong for France. Italy's find of the past couple of years, Franco took her game to new levels in this year's tournament, adding subtlety and fitness to her power carrying game. She has become Italy's go to ball carrier and though teams know she is coming, she is incredily hard to stop. Brilliant to watch. Ireland's openside would surely say that she didn't hit her own high standards in every game this year, but such has been her effectiveness in Ireland's toughest games against France and England that she still makes it here despite the valid claims of players like Beth Lewis and Sarah Beckett who all could easily have made this backrow. Despite her poor game against Italy and the constant switching between 9 and 10, we give Bourdon the nod here for the sheer influence she had this year when directing the French pack. Her brilliance when she moved back to 9 against England was a reminder of where she is best deployed. Leanne Riley was strong for England too. The most consistent player for England for many years, Mclean looks to be getting better and better and Simon Middleton must be thrilled with her all round contribution, from pinpoint kicking to passing to general leadership. Probably the most consistent and reliable player in the world right now. Excitingly for England, Breach still has plenty of areas to improve on, but her finishing is world class and as a result she probably makes every team on the planet right now. Still so young, she's going to be a mainstay for years. Italy's Ms dependable is a glue in the middle of the park for her side. A strong kicker, powerful tackler and a player who hits great lines, she was often the player to come up with crucial scores this season. French centre Gabrille Vernier also impressed as did Welsh centre Lleucu George late in the tournament while Zoe Harrison is an interesting option here for England. How England must be thrilled with her decision to return to the 15s game. Still finding her feet following the switch, she has still been world-class with her assured presence, pace and strike running ability a constant asset for England. Michela Sillari also performed well in this spot. The pacey French back three player has been in very good form this year. Brilliant in particular against Ireland, she has speed, footwork and great finishing skills and beats off the claims of Jasmine Joyce and Kelly Smith here. Aura Muzza and Eimear Considine are other wings to have impressed. 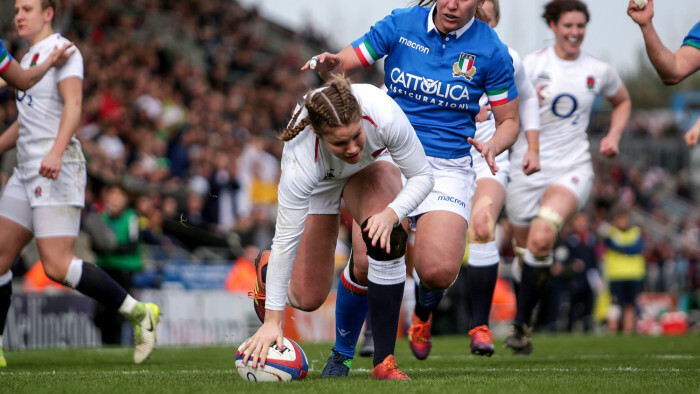 She has been one of Italy's best player for years, and though she has probably had stronger Six Nations than this one, she was still absolutely vital in key wins over France and Ireland. Given time and space she is one of the world's best 15s and she edges out the impressive Sarah McKenna for this spot.